COSTA MESA, CA. – June 7, 2013 – Channel Vision, celebrating 20 years as a leading manufacturer of innovative technology products for the Well-Connected Home™, today announced they released a Front Door Intercom Amplifier Kit for their DP Series and IU Series Front Door Intercom Stations. 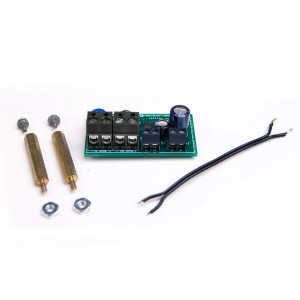 Channel Vision’s TE-AMP kit provides added volume and clarity when DP and IU Series Front Door Intercom Stations are placed in conditions with excessive ambient noise or requires louder sound levels. The TE-AMP Kit is an easy upgrade that can be done in the field or can be ordered with your next DP or IU Series Front Door Intercom Station. The TE-AMP Kit can be added to existing Channel Vision Front Door Intercom Stations. Channel Vision’s Home Intercom Systems are designed specifically for the installation market and are available for purchase through Channel Vision’s distribution network of custom retailers, distributors, dealers and installers internationally. For additional information please visit http://www.channelvisionelite.com. Channel Vision is a leading manufacturer of innovative technology products for the Well Connected Home™. The Company’s broad-range of solutions are designed to provide lifestyle enhancements, while equipping homes and businesses for greater safety, convenience and entertainment. Channel Vision is proud to provide high quality, dependable products that are backed by its 5 Star Program, one of the finest customer service programs in the industry. The program includes: Free System Design & Layout, Customized Manufacturing, Free Industry Approved Training Classes, 1/10/20 year warranties and 24/7/365 Technical Support. For more information on Channel Vision’s family of products, call 714-424-6500 or visit www.channelvision.com.